Can the application of market thinking to any aspect of learning be a good thing? If we support the idea of a universal, comprehensive education system free of markets, selection and hierarchies surely we have no use for market metaphors? 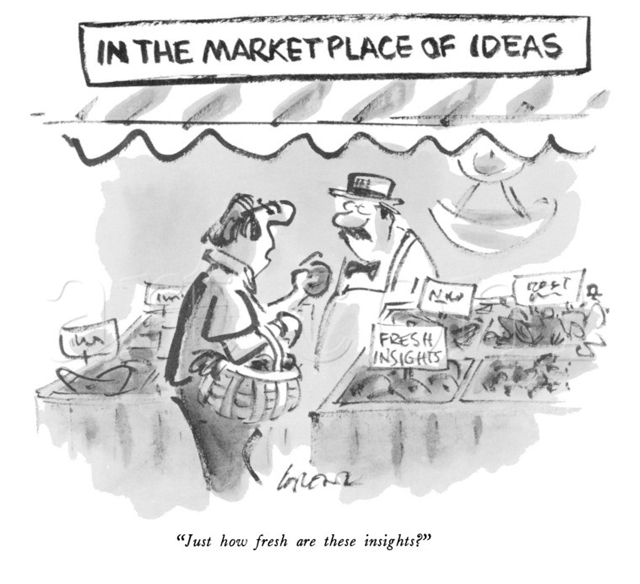 Maybe there is an exception; the so-called ‘marketplace of ideas’ metaphor first used by the philosopher John Stuart Mill in On Liberty (1859). The idea is broadly that in an open society with freedom of expression, different ideas and opinions confront each other in a free and open encounter. Bad or wrong ideas can be challenged and the best win out. For this to work, a level playing field is needed where a wide range of views can be heard and where people have the evidence and critical skills to evaluate them rationally. The model lends itself well to scientific and technological discourse where truth, albeit provisional, is easier to establish and expert peer-review is common. Things get more difficult when the ideas which are doing battle are cultural, political or religious where belief and tradition play a bigger part. The notion that all the various ideas and opinions available are swirling around in a social ‘marketplace’ is appealing. Good ideas will be picked up and adopted, or ’bought’ by more people depending on how attractive or useful they find them. They will be tested and sharpened in debate with alternatives. Some will catch on and ‘succeed’ as intellectual commodities while others fail. Some will change through use and evolve into quite different ideas. Here, perhaps, is one market where we don’t need to be cash rich to have plenty of choice. So perhaps this is a marketplace where it is theoretically possible for us to be on an equal footing and play our part regardless of our actual wealth and power in the real economy. Nevertheless, to make wise purchases we do need a solid educational grounding, a commitment to reason and some decent judgement – things which can take a lifetime to acquire. Even if this market seems free, the truth is that the ideas of those in power or those which are backed by the strong are generally dominant. Reason does not always win out and some pretty poor ideas can become influential if they are persuasively expressed. And if power and dominance are important factors, so are numbers. Ideas which have mass support will carry extra weight for good or ill. In a democracy, elections don’t establish the truth of ideas just the support they have. Being one of many in holding a particular view doesn’t make that view any more correct but wrong-headed ideas with widespread support are obviously harder to resist. For example, superstitions persist not because they have stood the test of rational challenge but because they are believed by many people and get passed on. So where does this leave us as consumers of ideas in this less-than-free market? Do we give up and believe nothing? Or anything? Or do we just go with the majority for an easy life? Like informed consumers in any real markets, we need to understand the choices which we have. To make the most of our position, we need to shop around and find the most reputable retailers. We need to cultivate healthy scepticism of the claims of salespeople and ask searching questions of their evidence, methods and motives while at the same time holding on to our hope that truth and wisdom can be found out there. In short, we need to be critical and ethical consumers while acknowledging that we will make the occasional unwise purchase and that we can always do better. No matter how confusing our experience of the market of ideas is, we have to maintain a constant and utmost respect for truth and reason and distinguish them clearly from opinion and ideology. This doesn’t mean rejecting opinions or belief systems but as we develop our own, they should be built on foundations of truth and reason, open to challenge and informed by the sort of values which we can justify to ourselves and others. The idea that human culture is developed through the competition between ideas for our attention and approval is pretty good. It’s not a bad place to start if we aspire to a better, more equal world based on truth, reason and mutual respect. We just need to be aware of all the distortions and injustices and recognise that the marketplace of ideas is not necessarily any freer or more democratic than the ‘real’ market. Future posts will examine the idea of ‘memes’ and ‘powerful knowledge’. This entry was posted in Philosophy and tagged ideas, knowledge, marketisation, rationalism, truth. Bookmark the permalink.